In seeking metal shelving to outfit your storage facility, it may seem difficult to discern which sources of storage equipment are the best to buy from. However, if you take the time to look at the options available to you, you’ll be able to find commercial-grade storage equipment at prices that won’t overreach your budget. The two primary types of sources to choose from are local and national sellers. Local providers may seem more likely to save you time and money in purchasing equipment, but you’ll often have to be more careful with them in terms of product quality, especially if you’re buying used. National suppliers, however, often have clear quality standards that you can trust. 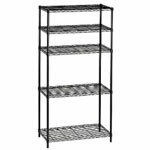 To learn more about finding a reputable source for metal shelving, contact Ace Industrial Equipment today. We proudly offer top-quality new and used storage equipment to companies of all kinds.